A related question - there are three .exe files that came with the main .exe - do I need to run them as well, or did the installer do that automatically? Personally I would not let the DIM install bryce content, but run it to a temp folder and then check this PDF. I see why you recommended Horo's write-up :) Pretty complex stuff, but thanks to him, its all under control. Couple more questions, if I may - I see in my downloads I have some Bryce 5 content packs - are they worth getting? Secondly, why do you recommend not using DIM to install - is it all too complex for DIM to handle? 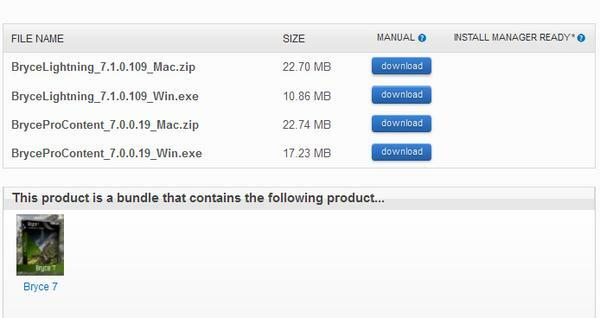 I'm guessing the Bryce 5 content files will be .exe's, so no way I would know what is in them before installing. So, if I don't use DIM, I 'm assuming I'll have to execute to a temp file, see what's there and then copy into the correct folders? I say do it manually as the Bryce content set up can be complex, and I personally trust my brain more than I trust DIM to get it right, but I have to admit that is just me. I'm fortunate in that I'm doing a completely new install of everything on a brand new machine, so easy to see whether there are any mess-ups. Ah right. I did that just about a year ago. I've also uninstalled the two 2005 C++'s as recommended. So I now have one 2008, 2 x 2010 and 2 x 2012 redistrubatables installed and apparently none of them have the required .dll. Bryce has 'side by side' issues. Poor dear. Why don't they include the damn thing in the Bryce installation package. There is more than one version of vcredist_x86.exe out there. The first one I got was 4,955KB and refused to install. The link from Analog produced a version half the size, identical name, 2,644KB and that indeed installed and Bryce started as if there had never been a problem in the first place. Thank you chohole for sticking with this all this time. Thank ewangrant1 for your update. With this information I could finally run Bryce 7.1 on my new Computer. I was going to order the newest Bryce ( I have 5.5) but there are way too many hoops to jump through to get it to work. I'm just not up to that. I guess I'll just keep playing with good old 5.5! I may be wrong, but AFAIK the issues are the same whether you use 5.5 or 7. Yes they are. I had to install the file when I first got my 64bit PC, and Bryce 5 was the first version of Bryce I installed. That's interesting. I've been running 5.5 on my 64 bit machine for several years and have had no problems with it. I didn't download anything extra. I had a backup copy on CD and just loaded on my new computer a few years ago. Was that on Windows 7? Which is what this thread is about. So what problems are you experiencing with Bryce 7 that you didn't have with Bryce 5? Hmmmm, I posted earlier and it isn't showing up. Anyway, I don't yet have Bryce 7, and was hesitant about getting it based on this thread. I am happy however, to know that if I do get it, and there are problems, that there are people here willing to help. I got brand new 64 bit computer with Win 7 64 bit. I got today Bryce 7 Pro. Before installed files vcredist_x64.EXE and vcredist_x86.EXE but install does not work. I do three install attempts on attached video, after 3rd install completes somehow but the Bryce never starts and is not present in start menu. No icon, only uninstaller is present. How did you install Bryce, and did you install all the files. there are 4 in total, but you don't need to install Lightning unless you want to set up a render farm. These 2 are the content files. 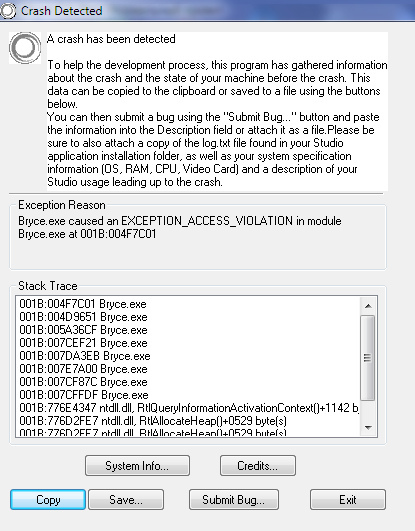 Normally you would install Bryce 7 first, and then run the vcredist_x86.EXE if you get the side by side error. I do something wrong, my files are only around 20 MB! I have bought Bryce Pro 7. 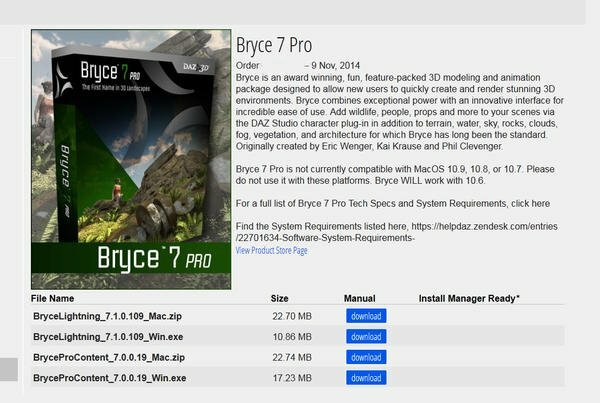 Do I have to instal Bryce 7 first, where is the download link ? I have only the links on attached photo. Those are the Addon content for Bryce. You need to download and install the program files as shown in chohole's first image. OK. I found the problem. I had to install from the PRODUCT LIBRARY Bryce 7 first and the Pro after. I can not believe I was so blocked. Sometimes it happens. Thanks for Help. this hint worked for me perfectly thank you very much!!!!! Uninstall all versions of "Microsoft Visual C++ 2005 Redistributable" ALL of them. Leave the 2008 and 2010 alone. Only uninstall the 2005 versions. You dont have to reboot at this point. Download and install this version from Microsoft. and the side by side error should be gone. I dont think you want to "uninstall all 2005 redistributables".... Various programs install their own, and you may be breaking something else. I have 5 (x86 versions on my system. You just want to install the mfc update version. Then windows update will keep it patched. Here's mine which was last patched in June of 2016. This is probably this first time in about 12 years that I Ioaded Bryce onto my computer. The file you suggested worked and I got to play around a bit.